Danielle H. Rochlin, MD1, Clifford C. Sheckter, MD1, Christopher J. Pannucci, MD, MS2, Arash Momeni, MD1. 1Stanford University School of Medicine, Palo Alto, CA, USA, 2Division of Plastic Surgery, University of Utah, Salt Lake City, UT, USA. Venous thromboembolism (VTE) is a dreaded complication following microsurgical breast reconstruction. While the high-risk nature of the procedure is well-known, a thorough analysis of potentially modifiable risk factors has not been performed to date. The purpose of this study is to analyze the association of such factors with the postoperative occurrence of VTE longitudinally. Using the Truven Health MarketScan Database, women who underwent microsurgical breast reconstruction from 2007-2015 and who developed postoperative VTE within 90 days of reconstruction were identified. Predictor variables included: age, timing of reconstruction, body mass index, history of radiation, history of VTE, Elixhauser comorbidity score, and length of stay (LOS). Logistic regression was used to evaluate predictors of VTE. Poisson regression was used to evaluate changes in VTE over the study period. 12,795 women were identified, of which 167 (1.3%) developed VTE. The majority of VTEs (67.1%) occurred post-discharge (Figure) with no significant change from 2007-2015. Significant predictors of VTE included Elixhauser score (p<0.001), history of VTE (p<0.03), and LOS (p<0.001). 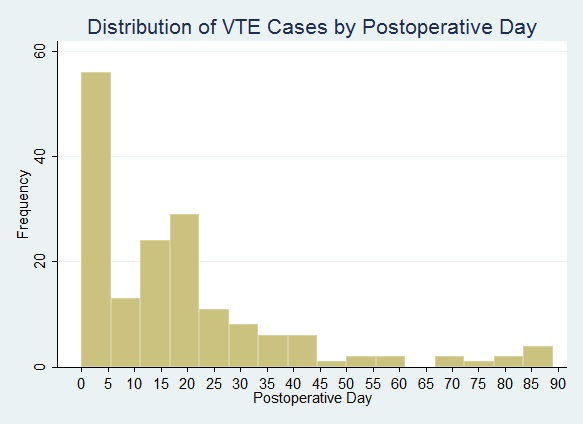 Postoperative VTE continues to be an inadequately addressed problem as evidenced by a stable incidence over the study period. Identification of modifiable risk factors, such as LOS, provide potential avenues for intervention. As the majority of VTEs occur post-discharge, future studies are warranted to investigate the role for an intervention in this period.